Definition at line 257 of file bcrypt_main.c. Definition at line 30 of file butterflies.c. Definition at line 29 of file butterflies.c. Definition at line 514 of file locator.c. 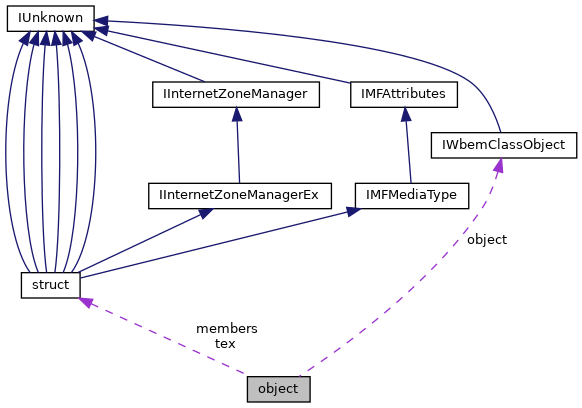 Referenced by impl_from_ISWbemObject(), and object_Invoke(). Definition at line 519 of file locator.c. Definition at line 520 of file locator.c. Definition at line 259 of file bcrypt_main.c. Definition at line 517 of file locator.c. Referenced by d3dx9_parse_array_selector(), get_member_dispid(), get_member_name(), init_members(), and object_Release(). Definition at line 518 of file locator.c. Definition at line 516 of file locator.c. Referenced by init_members(), object_get_Properties_(), object_Invoke(), object_Release(), and SWbemObject_create(). Definition at line 515 of file locator.c. Referenced by object_AddRef(), and object_Release(). Definition at line 27 of file butterflies.c. Definition at line 28 of file butterflies.c. Definition at line 22 of file butterflies.c. Definition at line 23 of file butterflies.c. Definition at line 24 of file butterflies.c. Definition at line 26 of file butterflies.c. Definition at line 25 of file butterflies.c.